Everyone is obsessed with virtual reality - reclusive, isolated, and completely entertained. The only time the people of VERDACOMB gather in the 'default reality' is during a music festival held around an ancient stone arena. Within the pit, volunteers use organic battle mechs called Orb Suits to compete in an electromagnetic death match. Unfortunately, the game raging within the arena is rigged, the entire system is corrupt, and people are dying for nothing. To make matters worse, no one seems to know or care. With the hope of awakening the city of VR addicts to the truth, three friends have united to expose the Harvest Game once and for all. 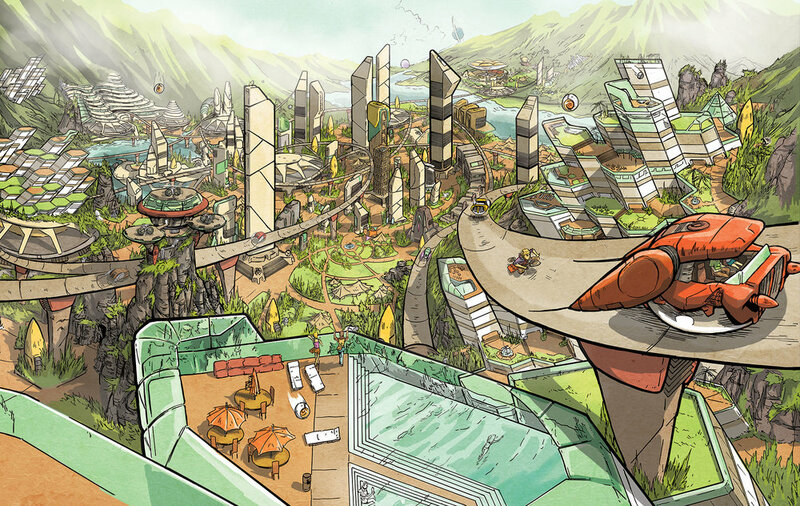 Or will the people of VERDACOMB continue to revel in a virtual slumber? Dan and Melissa Berry live on a blueberry farm outside of Portland, Oregon. Together, they started Fun Guy Studios LLC, which independently publishes graphic novels called VERDACOMB and TOFUZILLA. With VERDACOMB they have created a world addicted to virtual reality... where everyone stays at home and the streets are empty. Except once a year the citizens gather for a music festival held around an ancient stone arena... The story follows three friends who have united to expose the corruption behind the system, and wake up everyone from their virtual addictions. Chapter One: Denuva is available to read for free at www.verdacomb.com! TOFUZILLA is a series of time travel events taking place within the same general universe as VERDACOMB. Filled with Terra Organic Fighting Units (TOFU Mechs), a mysterious space-suit girl, and a seemingly conscious crystal - saying much more would risk spoiling the story itself! You can read all of Parts One and Two at www.tofuzilla.com since it is and always will be a webcomic!